Cisco product symbols are globally recognized and accepted as the standard in network symbols topologies. Edraw Network Diagram software includes the standard Cisco product symbols. It's easy to design and diagram your network diagrams. The Cisco Product Symbols template includes about 200 standard blue theme Cisco shapes. The color can be modified in the software. You can ungroup the shape then modify the detail too. Special symbols of highly detailed, accurate shapes and computer graphics for AAAKPI, Appliance General, ASIC Processor, Cisco Centri-Firewall, Cluster Controller, Disc Subsystem, Fibre Channel, Event Manager, Fax Phone etc. Here are special and highly detailed symbols, accurate shapes and computer graphics for firewall break, gateway VPN, HP Mini, IBM Cluster controller, Cisco IOS Firewall, IP Phone, Cisco ONS etc. They are special and highly detailed symbols, accurate shapes and computer graphics for Security system, server with music on it, SVX, Tape, UBR, VPN, Wireless Transport etc. 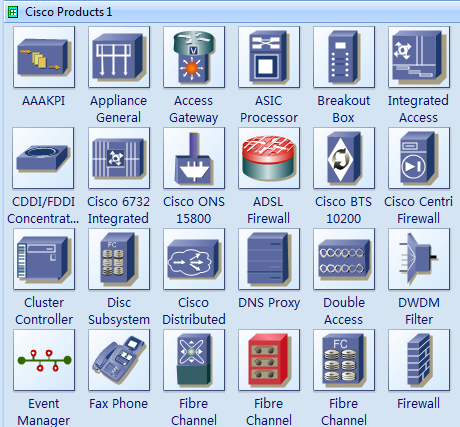 After the launching of Edraw Max Version 9.0, Cisco Prodcut Icons library is expanded with massive related resources. 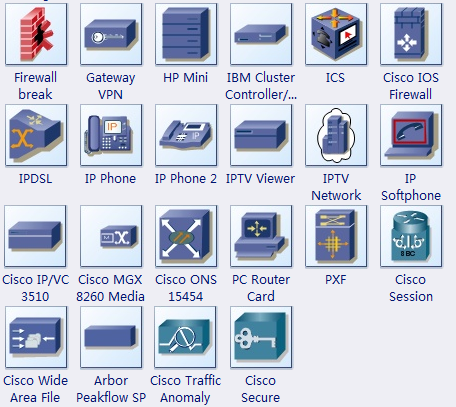 The following images are icons from Cisco Product Icons liabrary for your reference.